Orange County Tree Services was called out to Orange Park Acres in the city of Orange for a tree estimate. This estimate was for trimming several trees and removing one dead Olive tree. Our customer had recently bought the property and the trees were not maintained on a regular basis. There were several trees’ suffering from the lack of water. The customer was worried that the trees would not make a full come back. We took a look at the soil conditions and recommended a fertilizer program for the trees. After turning on and checking the sprinklers we recommended a few repairs and adjustments on the sprinklers. The first day of trimming our crew noticed several branches that were cracked on the Mulberry tree. 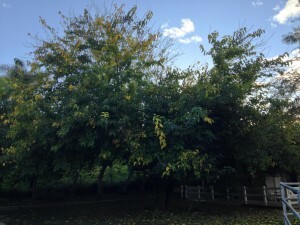 The branches had to be removed which created a large hole in the trees crown. The good thing is that this tree will fill back in a couple of years. 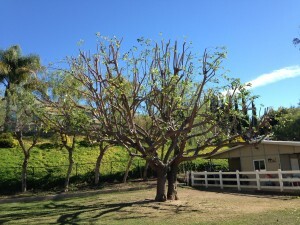 Before we cut the branches we gave our customer the option of leaving the damaged branches or removing them. The reason for the branches cracking was due to too much weight. You can let your trees grow large and healthy but you must remove some of the weight from the branches on a regular basis. This will keep the branches from cracking or even falling off of the tree. A dead Olive tree was in the main entrance to the property, so we removed it. This was a very easy removal for our crew. 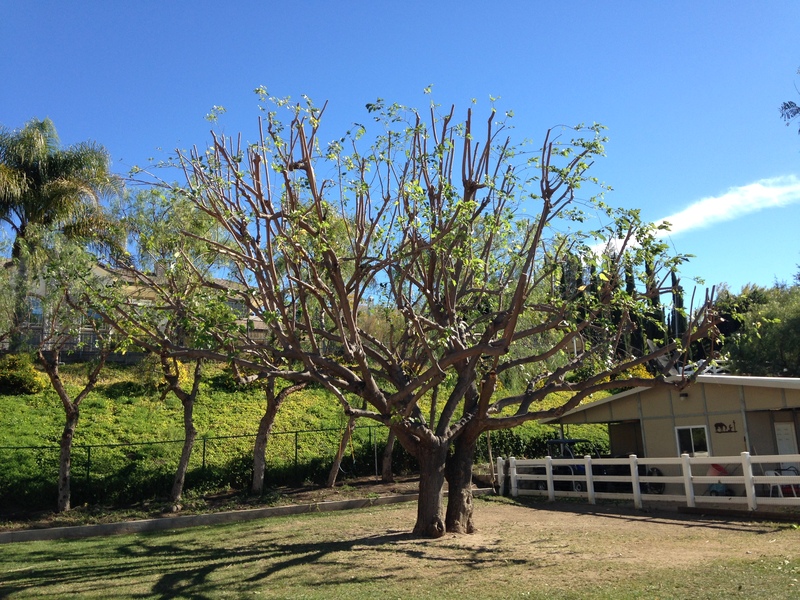 We have removed thousands of trees in Orange County over the past 20 years. You can be assured if you hire us for tree removal we will take every safety precaution. We always recommend keeping a tree alive but if our customer wants to remove a tree, we will give them options on planting a different tree that better suits their needs. When you call us out for tree service your not only getting a tree trimmer but a lifetime of landscape knowledge.